Platelets have powerful healing properties, containing growth factors that trigger and regulate cell growth. In PRP (Platelet-Rich Plasma) treatment, we start with your own blood and use a centrifuge to isolate platelets from the other components. The resulting substance, PRP, contains 3-5 times the number of platelets as regular blood. By strategically reintroducing this platelet-rich plasma to the body, we can harness the benefits of cellular growth and regeneration to aesthetic benefit. 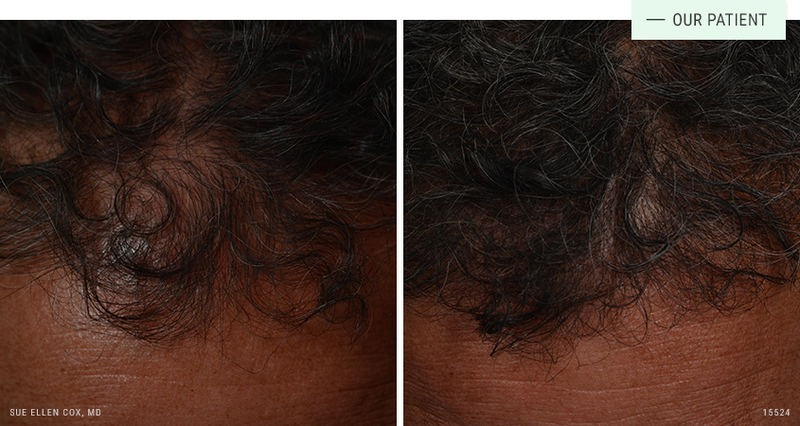 Before | After: This patient received two PRP treatments. He declined a third because he was so happy with the improvement. Expertise: An injectables expert, Dr. Cox specializes in PRP for accelerated healing as well as for treatment of thinning hair. Because PRP is derived from your own blood, it has an excellent safety profile. Like any surgical or non-surgical procedure, there are risks. As an international teacher and trainer of other physicians in facial anatomy and injection technique, Dr. Cox stresses the importance of finding an experienced physician who understands the finer points of injectable treatment. PRP treatment is well tolerated. It may be applied topically post-procedure to accelerate healing and boost results, or injected into the scalp to stimulate hair growth. The treatment process differs for each approach. PRP may be combined with microneedling, and resurfacing procedures like CO2, Fraxel Dual laser, Halo laser and Halo Pro laser to reduce recovery time and improve results. We begin treatment by drawing a small amount of your blood. While you numb for your resurfacing treatment, your platelets will be isolated into PRP with a centrifuge. Immediately following your resurfacing treatment, the PRP will be applied to the treatment areas and penetrate deep into the skin. While PRP will not eliminate downtime, it does reduce it significantly. Clinical studies also demonstrate that the application of PRP boosts efficacy of these treatments and produces superior results. PRP may also be injected directly into the scalp to stimulate hair growth. We will begin treatment by drawing a small amount of your blood. Your platelets will be isolated into PRP with a centrifuge and then injected into areas of thinning hair. This portion of treatment typically takes no longer than 15 minutes. There is no downtime associated with PRP scalp treatment. When applied to the skin after resurfacing treatment, PRP reduces recovery time and enhances treatment results. During your consultation, Dr. Cox will provide an individualized explanation of what to expect based on your unique treatment plan and goals. When injected into the scalp, PRP stimulates hair growth, resulting in thicker hair and increased coverage. A series of 3-4 treatments is required for best results, with maintenance treatments 1-2 times a year. PRP is well suited for female and male pattern hair loss. Dr. Cox will provide an individualized assessment to determine and explain how you might benefit.